A phone that looks, feels, and is expensive, the Huawei P9 Plus has a generous dollop of luxury to it. Thanks to very solid battery life it's easy to live with too. However, at this price you can pick almost any phone you like, and we're not convinced its pressure-sensitive screen and dual camera setup quite earn it a place at the very top of the league. The Huawei P9 Plus is a top-end phone. It's bold, it's pricey and out to offer features the company couldn't even fit in the normal Huawei P9, already an expensive device. A pressure-sensitive Press Touch screen is at the top of the list, along with an ultra-flashy metal finish. Even without the various show-off finishing touches, the Huawei P9 Plus is a top-quality phone whose battery life is stronger than a lot of its peers. At £549/AU$899 (around $730), though, it has stiff competition from the Samsung Galaxy S7, and even the Samsung Galaxy S7 Edge. Like almost all high-end Huawei phones, the P9 Plus has a top-quality fingerprint scanner on the back. If you're used to a front scanner it may take a little getting used to, but is about as intuitive to use as any. It's designed to sit roughly where your index finger lands, and as it sits in an indent there's no searching about needed. A top feature of the P9 Plus's scanner is that it works near-instantly when the phone's asleep, even though there's no button-press involved: it's a static pad. The real stand-out feature is the pressure-sensitive screen, though. This is something Huawei first experimented with in the Huawei Mate S Premium, although that model was not widely distributed. This one, with any luck, will be. The use of the technology is fairly similar to Apple's in the iPhone 6S, and far more useful than it was in the Huawei Mate S.
A harder press on most of Huawei's app icons brings up a little menu that lets you zoom right to a specific part of an app. You can head right to the Display part of Settings, to the Monochrome mode in the camera, or to a favorite contact in the Dialer app. It's hardly essential, but can save you a few seconds if you train yourself to actually use the feature. Pressure sensitivity can also be used in the gallery to zoom in and out of images just by applying more or less pressure. It's a decent way to check for perfect focus, or to see how much detail is really in that night shot you just took, without having to get two fingers involved. 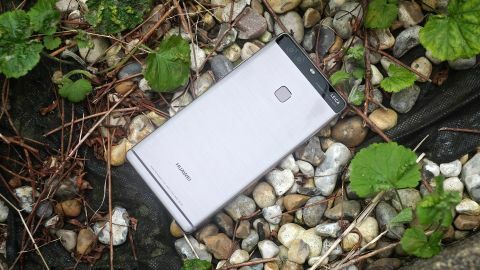 The Huawei P9 Plus's problem is that these pressure-sensitive features aren't applied at Android OS level. They're a part of Huawei's custom interface, and that means we won't see any (or at least not many) uses for pressure sensitivity in third party apps until it's adopted by Android and its system-level APIs. We saw the exact same situation with fingerprint scanners. They were used years before they were officially brought into the Android fold with 6.0 Marshmallow, which standardized how scanners were used, making it much easier for developers to add support for such features. Huawei is a bit of a trailblazer here, its efforts are likely to inform how Google employs 'official' support in a future version of Android. The Huawei P9 Plus doesn't make pressure sensitivity seem essential, but it hasn't messed up either. The part you should care about more is pure display quality. It's very good, if not quite a match for the Samsung Galaxy S7 Edge. The Huawei P9 Plus has a 5.5-inch Super AMOLED display of 1080p resolution. That gets you a nice big canvas for films and games without the phone seeming remotely impractical, and an AMOLED panel guarantees superb contrast. Unlike an LCD, OLEDs use emissive pixels. This means it can leave parts of the screen pitch black even while other areas are lit, while a phone LCD's backlight actually covers the whole screen whenever it's on. You won't necessarily notice the difference in daylight, but there's a huge difference if you like to watch a bit of Netflix before bed. OLED blacks are simply blacker than LCD blacks. This panel also gives the Huawei P9 Plus almost perfect viewing angles, with virtually no brightness loss at an angle. Whites go a tiny bit blue at an extreme angle, but you get this effect even with the latest Samsungs. Some OLED phones suffer from very clear color oversaturation, as phone makers often get a little overexcited by the sheer depth of color these screens can put out. Huawei has done well here, though. While you can't get the extreme sRGB color accuracy on offer in the Galaxy S7 family, you do get a choice between 'normal' and 'vivid' modes. Normal is a smidge oversaturated, while vivid lets loose a little more, making tones look a bit more energetic. A good way to tell how your own phone responds to color is to look at some of Google's app icons. Where YouTube uses a pretty vivid red, the Chrome and Gmail tones have a more pastel-like tone. Check it out: if they both look radioactive, you know your phone doesn't have full control over its display. The P9 Plus 'normal' screen mode has a good balance, with a rich, poppy look but just enough restraint. It's a lovely screen. There's another side to the display customization too. The Huawei P9 Plus lets you fiddle with the color temperature of the screen, lightly tweaking the white balance. A lot of phones let you choose a warmer (orange) or cooler (blue) character, but here you can even make the display lean slightly towards a more purple or green hue. We'd recommend sticking to a warm/cool or neutral tone, though. A warm one can reduce eyestrain a little too. You can even switch the rendering resolution to 720p rather than 1080p, although this is just a power-saving measure. There's no other benefit when Android apps are designed to scale between resolutions. We'll take a look at whether it affects stamina later. The desired effect of the Huawei P9 Plus is that classic "no expense spared" feel. It's a slim brick of metal and glass. The only plastic invited to the ball is seen in the little strips near the top and bottom that let the antennas breathe. In this respect, the P9 Plus is quite a lot like the normal Huawei P9, except this phone has a much shinier finish. Both handsets are made of aluminum, but this one is buffed to such a high sheen you can see your reflection in its rear. It's the sort of over-the-top bling factor we were glad to see Huawei tone down in the P9, but it does manage to come across as expensive rather than gaudy. The finish does also show up scratches rather clearly, though, and is prone to picking them up. After being kept in a pocket for a couple of days it had earned a couple of fine scratches in the top-most shiny layer. You won't be pleased if you do the same after spending all that money. The Huawei P9 Plus design is similar to that of P-series phones of previous years. It's a tight, dense, skinny rectangle, just 7mm thick. The edges are bevelled and rounded off, lending the phone a soft feel even though its back doesn't taper or curve. It's very manageable for a phone with a 5.5-inch screen. If you don't like the silvery version we're using, there are gold and pink P9 Plus phones too. Like almost all top-end handsets, there's no access to the battery in the P9 Plus, and the SIM fits in a tray that pops out of one side of the device. The Huawei P9 Plus also has a memory card slot even though the phone has 64GB of inbuilt storage. That's a great combo. Huawei also keeps a feature almost all other top manufacturers leave out these days: an IR blaster. This is the little black dot on the top edge of the phone. It's used to mimic the signals of remote controls, and there's an app pre-installed that lets you teach the P9 Plus how to control your TV, your home cinema receiver and so on. This is a feature that sneaks in under the radar, but may even be enough to nudge some of you into a buy.